Byways Open To All Traffic (BOATs), represented as + on an OS Explorer map. Usually demarcated with a wooden 'Byway' sign. Unclassified Country Roads (UCRs), represented as '. on an OS Explorer map. 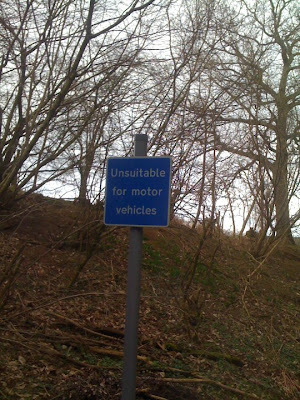 Not usually demarcated with a sign, and if they are it is usually with a 'Right of Way' or 'Public Way' finger-post. To complicate matters, UCR's must carry a precedent of vehicular access in order to be legally drivable (although how this is done is reserved for greater minds than ours!). Roads Used As Public Paths (RUPPs), represented as T on an OS Explorer map. Usually demarcated with a 'Restricted Byway' sign/finger-post since 2006. Very, very few are now open to motorised traffic, since in 2006 the Natural Environment and Rural Communitites Act considered almost all RUPPs to no longer carry access rights for vehicles. Best to avoid these unless you are certain you are allowed to drive it. The same applies to byways that are protected by a Traffic Regulation Order, or TRO. These orders, promulgated from the local authority, close a byway for a certain length of time to a certain class of vehicle in order to, for example, allow a byway that has been inappropriately or heavily used to be repaired and to recover. Always check for the latest information using the council's 'definitive maps' for the area you plan to visit to avoid disappointment. So, do you need anything special to go greenlaning? The answer is: no, nothing special at all! Although this site is written using a Land Rover Defender 110 as a benchmark vehicle, we are not Land Rover or even 4x4 specific (although you would be a far braver person than I to take a Porsche Cayenne greenlaning!). Any reasonable 4x4 is more than capable of driving all but the most taxing of southern green lanes straight off the shelf. The most important thing to consider is whether your vehicle is fully serviceable or not. It must be completely road legal: that is insured, hold a valid MOT certificate and taxed. Greenlaning is more demanding than a trip to the supermarket, and if something is wrong with your car whist it's on road, you can bet it'll get worse whilst off the tarmac! However, you can add various optional after-market products to enhance and protect your vehicle. A good rule is, if you think you'd need 'extreme' equipment to get through, you shouldn't be driving there in the first place! a recovery rope/strop, the higher quality and rating the better, with somewhere very strong to attach it to at both the front and back of your vehicle, eg JATE rings. You won't get stuck, but you might find somebody who is! a spade for digging water channels to drain the surface of the green lane should repairs need to be made, or to dig yourself out of snow/mud/etc! (optional) a bin bag to pick up any litter found. What are you likely to encounter whilst out on the byways? Fords are relatively uncommon in the south-east of 'Blighty', but surface water isn't! Always approach water with extreme care, and avoid it unless truly necessary. Water can be far deeper than it looks and can hide all sorts of obstacles and quagmires that can instantly wreck your day. If in any doubt at all, get out and take a long hard look on foot before deciding to continue. DO NOT cross a ford if it is swollen after recent wet weather; tragic accidents can and do happen. Ruts are the most common obstacle encountered. These are created either by agricultural vehicles going about their business, or by the passage of other vehicles, horses or walkers in the weeks, months, years and decades before your visit. Usually they result from a combination all byway users. Once in a rut, there is very little point in trying to extract yourself. The best course of action is to simply let the ruts take you where they want to lead you. Trying to fight against them and they will damage the byway surface, your tyres, and possibly your steering, not to mention that the wheels may suddenly grip and fling your vehicle out of the ruts and into walls or trees. As a rule, if the ruts are too deep to drive then don't drive that byway. Best to go off somewhere else and leave the surface to recover naturally. Overhanging branches are also a problem, as are fallen logs. However, you are within your rights to remove any obstacle which impedes your progress, so a quick blast with some secateurs or bow saw or to throw said log to one side and you're on your way. 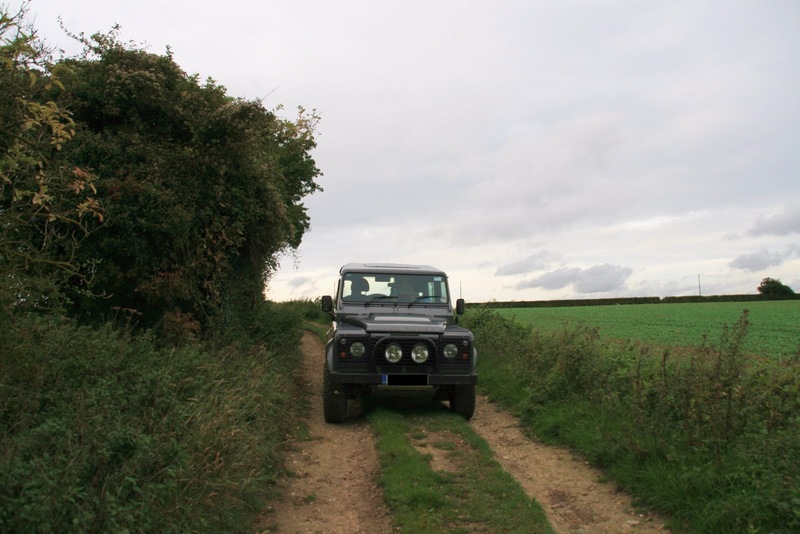 More dense overgrowth can very often be encountered, with some green lanes becoming so overgrown that it is impossible (and frankly daft to even try) to get through without scratching or, worse, damaging your vehicle. Avoid these until they have been cleared. It is the local council's responsibility to clear them, so feel free to report the state of the lane to them. Other users are often encountered, for example horse riders. Remember, everyone has a right to be there, but as a 4x4 driver you should go to extremes to be courteous and responsible. Therefore pull over if it is possible to do so, or reverse until their path is clear, switch off your engine, and wave and smile as they pass! If other users are spoiling for a fight, remain courteous and explain that you have every right to be there just as they do. If they still will not listen, make a note of the time and place of the incident, drive off to avoid further confrontation, and report it to GLASS here.Whilst on the courteous and responsible theme, it is IMPERATIVE that you stick to the designated track. To stray from it is a criminal offence as well as irresponsible, and makes you an instant moron and the despised enemy of all others who use the green lanes. If you wish to behave like an irresponsible, spoilt child, go to an off-road centre where you can get it out of your system without harming others. That said, even on the byways one is entitled to drive, purposely damaging the surface of a byway may be an offence. Take care, be courteous, stick to the trail, and go easy! Finally, ALWAYS abide by our Greenlane Code and read our disclaimer; there is further useful information contained on both pages. But most of all, enjoy yourself! GLASS: far more information of greenlaning that we could ever offer here. Join them as a priority! Land Access and Recreation Association. Pay and Play: find your nearest offroad site. Definitive Maps: check these against an OS map to see where you can legally drive, and for more information on TROs. Land Rover Owner International magazine: a treasure trove of information in every issue!